Bitdefender is a simple solution that stays out of your way and has all the essential features you need. Romania-based Bitdefender is increasingly one of the top antivirus choices these days. It's also a company not content to sit on its laurels, as evidenced by Bitdefender Total Security 2018, its full security suite. 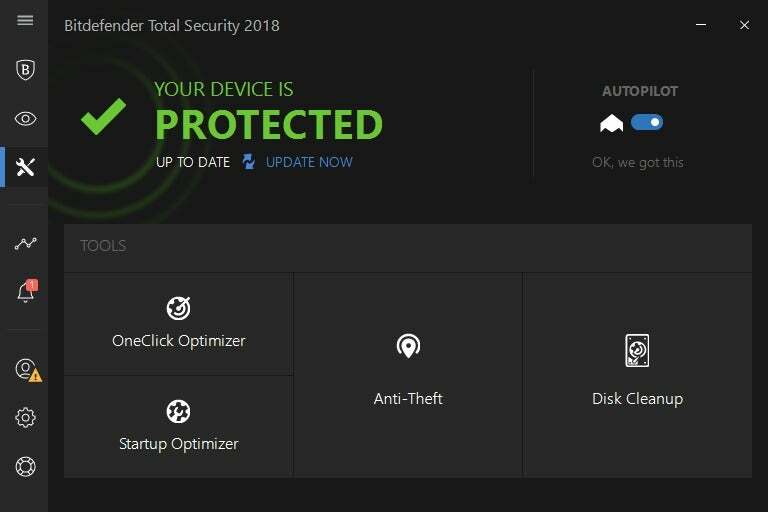 The look of Total Security 2018 is reminiscent of many other antivirus suites. The color scheme is dark grey and black, with essential information displayed in blue or green text to highlight it. The main navigation is in the left rail, where you can switch between the various menu options while viewing details in the main part of the window. One nice touch is how Bitdefender continually shows the status of your PC at the top of the main window for the first three options in the left rail. That does, however, make it a little hard to figure out what's going on when you switch between them—each section has the same basic color scheme. Each of these first three left rail menu options uses a tile-based interface in the main window. 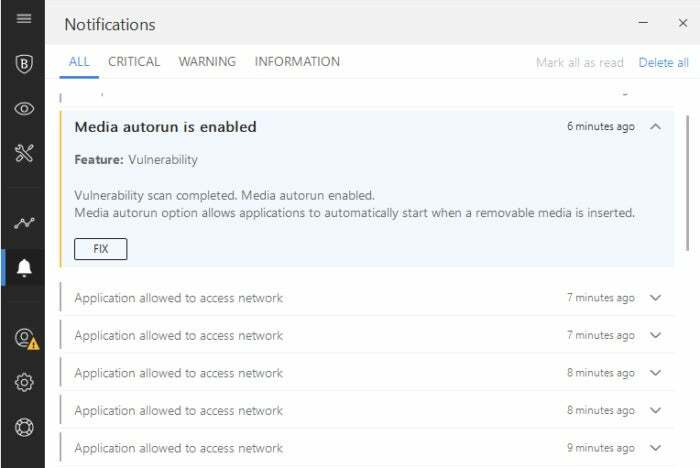 The top Protection option, for example, offers tiles for a Quick Scan or a Vulnerability scan. To dive into more thorough scans, click the blue View Features link in the main window. There are also three status tiles for Bitdefender's app protection, file protection, and web protection features. 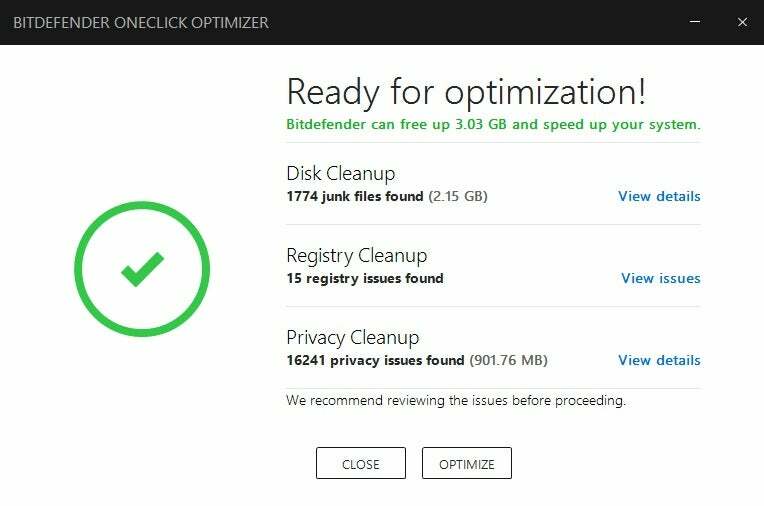 These tiles tell you whether Bitdefender has taken any action on your PC. When I first saw the interface, I expected to be able to click on these tiles. In time you can, once they actually have something to report, but at first they're just "dead" tiles with no information. The next left rail menu option takes you to the Privacy section, where you can set up a file vault for encrypted files. There is also a wallet feature for saving credit card numbers, as well as Bitdefender's Safepay, a sandboxed environment primarily for conducting online financial transactions. Safepay has a number of helpful features including the ability to block other apps from taking a screenshot, and a virtual keyboard that blocks keylogging. The Privacy section also houses Bitdefender's parental control features. The wallet is a password manager that can save website logins, as well as credit card numbers, address, phone number, birth date, application license keys, and so on. There are also sections for email login information, and router logins. This section lacks the ability to save notes or add attachments that need to be securely stored, however. 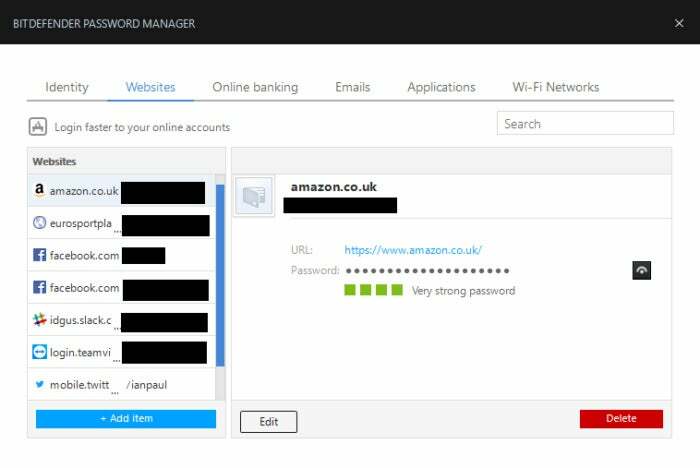 You can save files in Bitdefender's File Vault, but there are times when it's helpful to keep file attachments with login data: secret questions for your bank, for example, or other sensitive information best stored as an image or text document. If you need to create a firewall between, say, work and home information, you can create multiple wallets. Next up in the left rail is the Tools section, which offers the usual sort of extras you'll find in a security suite—like a startup optimizer, disk cleanup, a "find my device" tool called Anti-Theft, and a "OneClick Optimizer" that searches for useless files, registry entries, and "privacy issues" that can be safely deleted. These tools are, for the most part, available as built-in system utilities in Windows or as free third-party programs, but I suppose it's still worthwhile to have it all in one spot. Watch out with the OneClick Optimizer, as those "privacy issues" include your browser cookies by default. If those bits of data get nuked, you'll be signed out of all your usual online haunts such as Facebook, Twitter, and the like. The rest of the Windows desktop program is pretty straightforward. The notifications section is nice, and similar to a feature in the GlassWire firewall we mention in our ultimate free security suite article. You also get Bitdefender's Autopilot feature, which is activated by default. It takes care of all your PC's various maintenance tasks for you, like real-time antivirus protection, firewall protection, anti-phishing, anti-malware filtering, and automatic app updates. On paper, it's a solid set of extras, but in practice it feels more like a marketing bullet point than anything else. In my experience, these are all tasks that any competent antivirus suite is supposed to carry out automatically anyway. Bitdefender also takes an active role in your web activity. 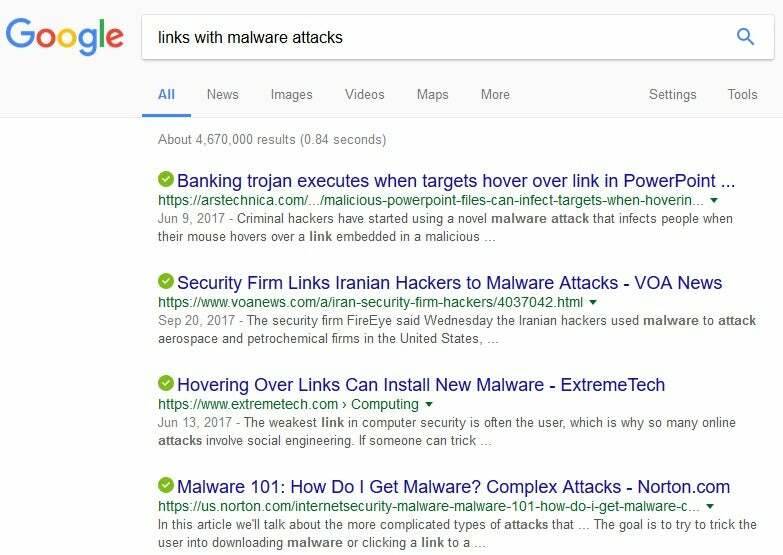 When you're searching online on Google, for example, it checks every link (presumably against a database of malicious ones). If the link is deemed safe a little green checkmark will appear next to it. If not, there's a yellow warning label with an exclamation mark. 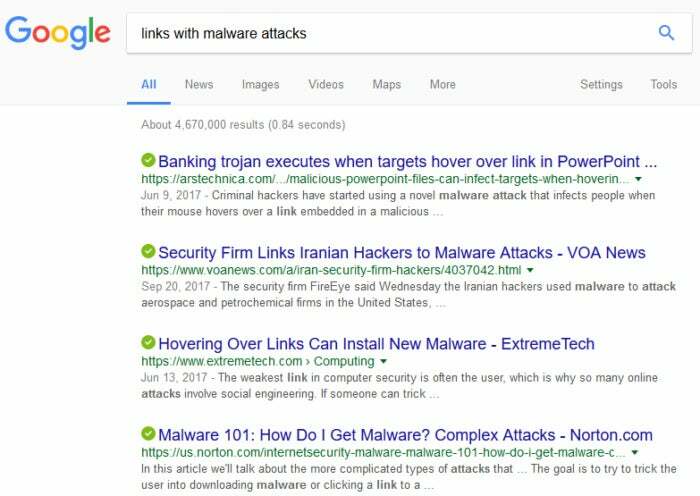 Bitdefender also checks external links on websites and social networks like Facebook and Twitter, though sometimes not consistently. Those check marks are not bulletproof, however. First, verification only happens for mainstream sites. Bitdefender completely ignored searches on DuckDuckGo and links on Techmeme, for example. Another time, I clicked on one of those Facebook quizzes in a moment of weakness (pre-Cambridge Analytica), and during my time on the external site, Bitdefender said it blocked four web-based attacks. I don't recall seeing a warning on the link on Facebook, but later when I returned to the same post on Facebook, Bitdefender placed a yellow check mark next to the link warning me not to follow it. As for the four web-based attacks, it was good to have real-time protection, but Bitdefender didn't explain what they were when I clicked on the warning. I did later get a slightly more detailed explanation in Notifications, but I didn't learn much outside of Bitdefender's belief that the website exhibited "suspicious behavior." Bitdefender performed very well in recent third-party testing. A-V Test gave Bitdefender a 100 percent performance on its zero day and malware tests carried out in January and February 2018. Bitdefender did, however, flag legitimate software as malware eight times over two months from a sample size of more than 1.5 million. That's still really good. A-V comparatives also rated Bitdefender very highly. In its March 2018 scoring for real-world protection, Bitdefender got 100 percent and 0 false positives among 216 test cases. The organization's malware protection test, meanwhile, rated Bitdefender at 98.8 percent for both online and offline detection rates. SE Labs in its January-March 2018 ratings gave Bitdefender a AAA rating—its highest ranking—alongside AVG, Avira, Eset, Kaspersky, Norton, and Trend Micro. Bitdefender's top rating comes after SE Labs' October-December 2017 report that gave Bitdefender a surprisingly low B rating. In our performance tests, PCMark 8's Work Conventional test scored 2541 after a full-disc scan with Bitdefender active. Without it, our test PC usually scores 2538. Since those two scores are within margin of error of each other, the takeaway is that Bitdefender has very minimal impact on system performance. Our Handbrake test also showed low to little impact. Our test PC takes one hour, 15 minutes, and thirty seconds to convert a 3.8GB MKV file to the Android tablet preset. With Bitdefender installed and running, the time was one hour, fourteen minutes, and fifty-five seconds. Again, the performance fell within normal margin of error. Bitdefender gets high marks for its malware performance, and its impact on system resources were nominal in our tests. Bitdefender's overall app design is good and easy to understand. Pricing is typical at $90 for a year of protection on up to five devices (new customers get a 45% discount for their first year) and $100 for 10 devices. The app also stays out of your way, which is nice, though you can't miss those green check marks when clicking around the web.